This 4-page publication is one in the series Risk Management for 4-H Youth Development Work. 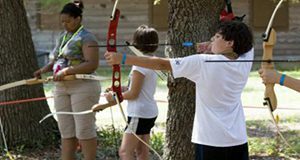 It discusses the 4-H Shooting Sports Program, which teaches young people the safe and responsible use of firearms, principles of archery, and hunting basics. Written by Jerry Culen, Dale Pracht, Paula Davis, Stefanie Prevatt, and Janet Psikogios and published by the UF/IFAS 4-H Youth Development Department, June 2018.